Former Fed Chair Ben Bernanke recently asked a question concerning the optimal long-run size of the Fed's balance sheet (Should the Fed keep its balance sheet large?). Bernanke comes down on the side of "keeping the balance sheet close to its current size in the long run." While he does not explicitly say how "size" is defined, I think it's clear he means the size of the balance sheet measured relative to the size of the economy (say, as measured by nominal GDP). According to this measure of size, the Fed would have to grow its balance at the rate of nominal GDP growth. In addition to the reasons reported by Bernanke, I think there's a public finance argument to be made for keeping the Fed's balance sheet large--at least, under certain conditions--like ensuring that the inflation mandate is met. Let me explain. Let's begin with a picture that most people are familiar with. 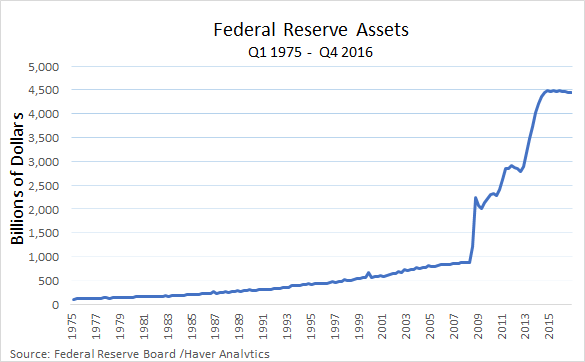 Prior to 2008, the Fed's balance sheet was under one trillion dollars in size. Prior to 2008, it grew roughly at the same rate as the economy. Most of these assets consisted of short-term U.S. treasury securities. Most of these asset acquisitions were financed with zero-interest money (currency in circulation). 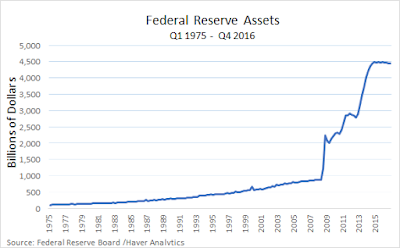 Since 2008, the Fed's balance sheet has grown to 4.5 trillion dollars. The composition of assets has moved away from short-term government debt to longer-term debt and mortgage-backed securities. Most of these asset acquisitions were financed with low-interest money (reserves). Is 4.5 trillion a big number? Well, yes. But then, the U.S. is a big economy: the U.S. nominal GDP for 2016 is close to 19 trillion dollars. So in measuring the size of the Fed's balance sheet, it probably makes more sense to measure size as a ratio. 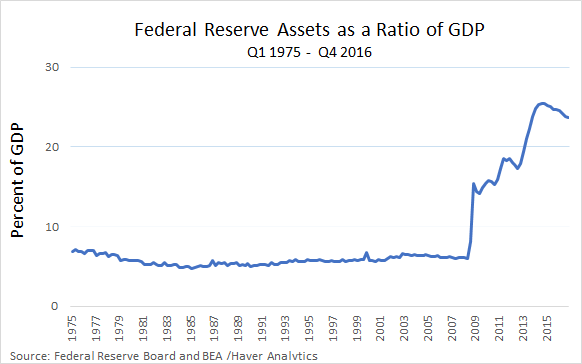 The following graph plots the size of the Fed's balance sheet as a ratio of nominal GDP. Prior to 2008, the size of the Fed's balance relative to the economy averaged about 6%. The balance sheet size peaked in 2014 at just over 25%. Note that by this metric, the Fed's balance sheet has been contracting since 2014. Now let's talk about the business of banking. I like to think of a bank as an asset transformer: a bank converts relatively illiquid assets into relatively liquid liabilities. The Fed buys relatively high-yielding (but safe) securities, like U.S. treasury bonds and AAA-rated mortgage-backed securities. It pays for these acquisitions by issuing liabilities (printing money) in the form of low-interest reserves. The Fed transforms high-interest government debt into low-interest Fed liabilities (money). 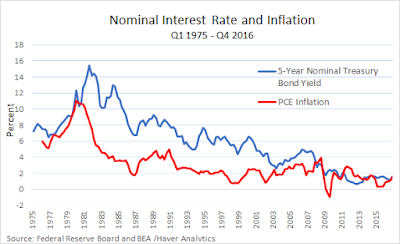 The difference between the interest the Fed earns on its assets and the interest it pays on its liabilities is an interest rate spread. Isn't it wonderful to be able to borrow at low rates and invest at high rates? This is precisely what the Fed did with its large scale asset purchase (LSAP) program. Apart from any other effects that this intervention had on the economy, it resulted in huge profits for the Fed. Keep in mind that any profit made by the Fed is remitted to the U.S. Treasury (and thus, ultimately, to the U.S. taxpayer). 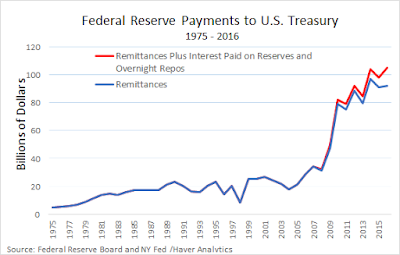 In recent years, the Fed has been returning about $80-90 billion per year to the U.S. Treasury. While interest rates were higher in the past, the Fed's balance sheet was much smaller--and so while the profit margin was high, the volume was low. Today the profit margin is smaller, but the balance sheet is much larger. 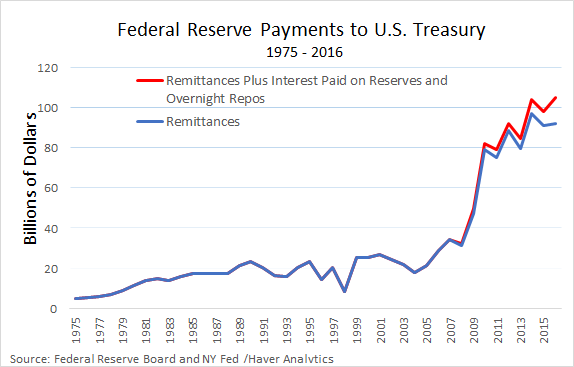 (The distance between the red and blue lines represents the Fed's foregone profit since it started paying interest on reserves in 2008). What sort of rate of return does the Fed make on its portfolio? The following graph plots Fed payments to the Treasury as a ratio of the Fed's assets. 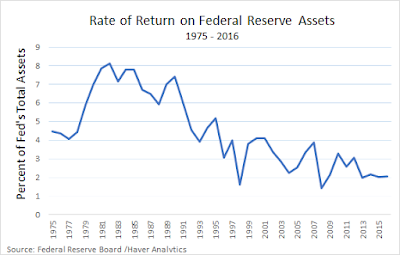 Since the bulk of the Fed's assets are in the form of U.S. government bonds, it should be no surprise to learn that the rate of return has generally followed the path of market interest rates downward. Still, in recent years, the annual rate of return is about 2%. Given that the Fed is presently financing these assets with cash (0%), ON RRP (0.25%) and IOER (0.50%), the profit margin is still significantly positive (though one wonders about the scope for further policy rate hikes if market rates remain low). In light of this analysis, why are some people calling for the Fed to reduce the size of its balance sheet? 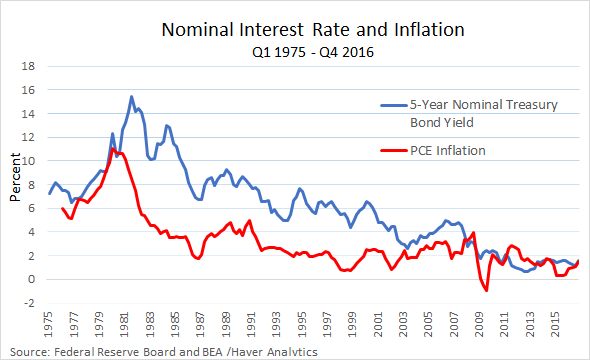 Usually the concern is that a large balance sheet portends higher future inflation. But we've been living in a world of lowflation for many years now and we're likely to stay there for the foreseeable future (though central banks should of course remain vigilant!). There is, in fact, some theoretical support for the notion of reducing the Fed's policy rate (subject to the dual mandate and financial stability concerns); see, for example: The Inefficiency of Interest-Bearing National Debt. Reducing the Fed's balance sheet at this point in time seems like a needless loss for the U.S. taxpayer. Given that the Treasury is marketing a bond, who do you want to hold it? If the debt is held outside the Fed, the government needs some way to pay the 2% carry cost of the debt. The government will in this case have to reduce program spending, increase taxes, or increase the rate of growth of debt-issuance. Alternatively, if the Fed holds the debt, the carry cost is generally much lower. This cost-saving constitutes a net gain for the government. So why not take advantage of it? P.S. I realize there are some who argue that a central bank enables big government. Since the government is too large, we need to end central banking and, in this manner, starve the beast. But this argument amounts to "let's make the government less efficient in terms of financing their operations--that'll force it to get smaller." This line of argument strikes me as naïve--I'm not sure what would prevent the government from simply substituting into different methods of finance. If you want smaller G, then lobby Congress to make G smaller. But given that smaller G, it should still be financed in the most efficient manner possible. And that means following the prescription above.